I'm currently working on a bst file for a multivolume companion (approx. 1800 pages in total). By using makebst, I tried to apply the guidelines that my publisher gave to me. Yet, the resulting bst file is not satisfying all my needs. Alpha, B. (edition numberyear). book title. publisher. Gamma, D./Epsilon, Z. (eds., year). booktitle. publisher. Iota, K. (year). article title, journal name volume: pages. Ny, L. (year). article title, "in:" E. Ditor (ed., year), book title. publisher. pages. I have already inserted the "ed., "/"eds., " before the year. Now I'm struggling with the edition number that should be superscripted right in front of the year. There ist still a ", " before the edition number. 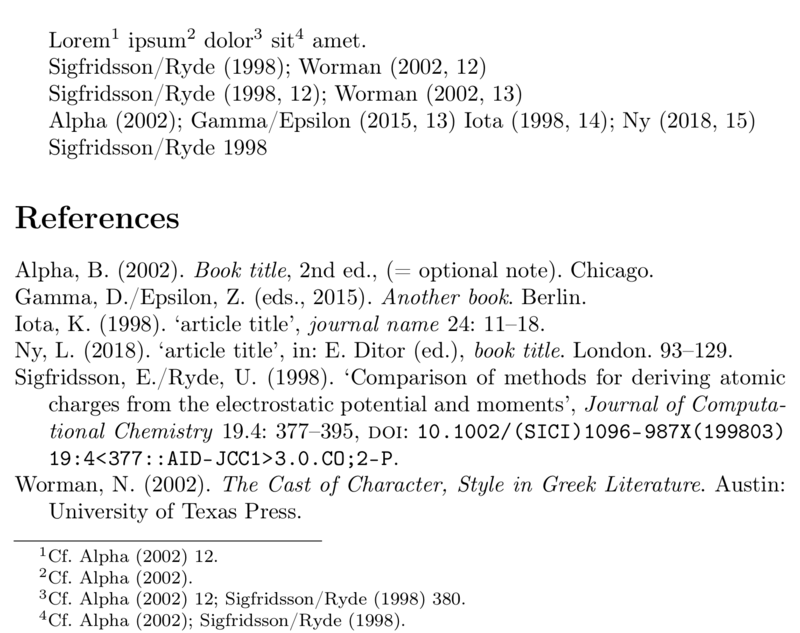 Also, it should appear in the in-text citation (e.g., "Alpha (edition numberyear, page)"). I would appreciate if some of you could have a look at the bst file. 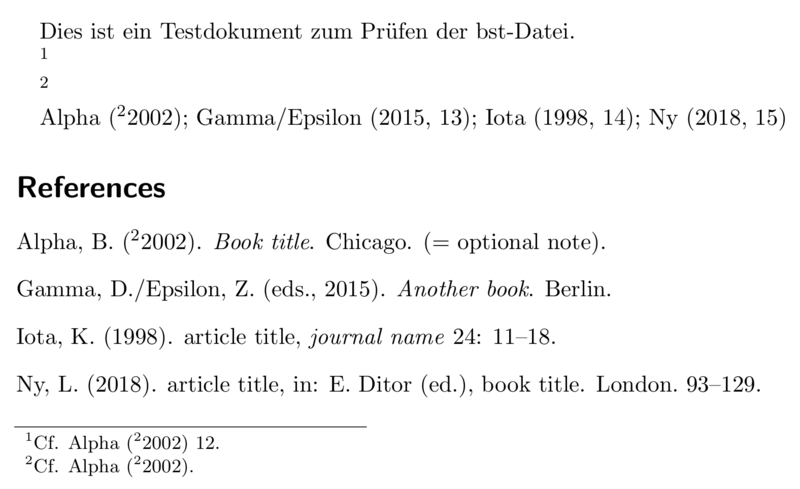 And maybe tell me how to get rid of the extra ", ", and how to add the edition number to the in-text citation. Dies ist ein Testdokument zum Prüfen der bst-Datei. Additionally, you'll need to make sure that postnotes are recognised properly. The footnote detection is more idiomatic with a boolean/\if... instead of a string variable. Normally I would suggest to use biblatex for complex custom styles as these, but (1) even these days publishers can rarely accept biblatex submissions (see Biblatex: submitting to a journal) - except if they take the PDF directly -, furthermore (2) you seem to have gotten quite far with BibTeX already and lastly (3) the combined editor/year brackets looks like it would need quite a bit of code restructuring (not impossible, but a lot of work). For the fun of it, here is a suggestion for a biblatex solution. Not the answer you're looking for? Browse other questions tagged biblatex bibtex or ask your own question. Is it possible to mimic the compiled bibliography automatically?